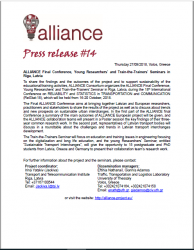 To share the findings and the outcomes of the project and to support sustainability of the educational/training activities, ALLIANCE Consortium organizes the ALLIANCE Final Conference, Young Researchers’ and Train-the-Trainers’ Seminar in Riga, Latvia, during the 18th International Conference on RELIABILITY and STATISTICS in TRANSPORTATION and COMMUNICATION (RelStat-18), which will be held from 16-20 October, 2018. The Final ALLIANCE Conference aims at bringing together Latvian and European researchers, practitioners and stakeholders to share the results of the project as well as to discuss about trends and new prospects on sustainable urban interchanges. In the first part of the ALLIANCE final Conference a summary of the main outcomes of ALLIANCE European project will be given, and the ALLIANCE collaboration teams will present in a Poster session the key findings of their three-year common research work. In the second part, representatives of Latvian transport bodies will discuss in a roundtable about the challenges and trends in Latvian transport interchanges development. The Train-the-Trainers Seminar will focus on education and training issues in engineering focusing on the digitalization and long life education, and the young Researchers’ Seminar, entitled “Sustainable Transport Interchanges”, will give the opportunity to 15 postgraduate and PhD students from Latvia, Greece and Germany to present their collaboration team’s research work.